Maggie, all 35 exuberant pounds of her, has lousy leash manners. That is because 1) she is a dog and walking beside me, shoulder to shoulder, makes no sense to her. And 2) because I couldn’t resist working her on sheep when we have training time together. Not to mention teaching her to come when called EVERY TIME and stop when told EVERY TIME, which is critical to dogs who live in the country and are off leash most of their lives. Leash manners are not critical, but that doesn’t mean they are not important, because of course Maggie needs to be on leash when we go to town or the vet clinic. I’ve put leash manners in the “I’ll deal with that when the weather turns,” and given that it was 4 degrees Fahrenheit this morning, I think our time has come. We’ll still work sheep until the snow gets too thick or the ice too dangerous, but it’s definitely time for me to add leash manners to Maggie’s growing repertoire. Here’s the thing about leash manners, people and dogs: Most owners don’t understand why it is so hard to teach dogs not to pull on a leash. Don’t we humans tend to walk at the same pace, shoulder to shoulder with our other friends? And aren’t dogs our “best friends?” But dogs aren’t primates, and they don’t come hard-wired to walk side-by-side like we do. In The Other End of the Leash I described walking politely beside a human from a dog’s perspective as “walking at the speed of death and ignoring everything interesting.” That’s why we need to teach leash manners as if it were a circus trick. Here’s how I do it; I’d love to hear your thoughts and experiences on the issue. I’ll keep you posted on Maggie’s progress as the weeks go on. STEP ONE: Begin by doing what you can to prevent pulling in the first place. That means using the right equipment. I like body harnesses that attach in the front (not the top of the dog’s back), like SENSE-ation Harness and Easy Walker. These types of harnesses, as well as head halters, give you more control over the dog and prevent them from pulling you along like a hay wagon attached to a set of draft horses. (I should note here that I only suggest head halters if the dog is especially large, exuberant or the person needs extra help controlling the dog. It is possible to injure your dog’s neck if you misuse head halters, so one needs to be cautious. But they do give you the most control and sometimes are the best option in early stages of training.) A great article comparing different ways to attach yourself to your dog is still on Sophia Yin’s website. Bless her and her memory. STEP TWO: Decide how you are going to reinforce this great trick your dog is going to learn. (Remember, it IS a trick to your dog–surely it makes no sense to them otherwise.) Food is always my first choice for reinforcing leash manners, because food is highly motivating and easy to deliver in small bits. I’m starting Maggie out with dried beef bits, because she loves them and I can put a handful of them into my pocket without them turning into mush. However, once the behavior is established I’ll add in other reinforcements, like a release to go play with Willie or a release to go run up the hill and find the sheep. Nothing will motivate Maggie more than access to the sheep, but on the other hand, nothing will be a bigger distraction for her. Thus, I won’t ask her to walk by my side on the way to the sheep until she’s mastered the behavior in easier contexts, and then only expect a few steps before I release her to the sheep. Gradually I’ll ask for longer and longer periods in which she stays beside me while we walk up the hill to the sheep. STEP THREE: As I’ve already noted, you need to be aware of how difficult it will be for your dog to concentrate on you. Think of it as a competition for your dog’s attention–you and the environment are competing and you need to know your competitor well. Always start when it will be easiest for the dog, and gradually work up to asking for walking by your side as the distractions increase. Last night I went outside with Maggie to begin working on leash manners, and quickly discovered she was too distracted to pay attention even to the fantastic food I had in my hand. So I moved into the garage (I also could have gone inside, I choose the garage because it was simpler, given that the other two dogs were in the house). Problem solved, now I could easily get her attention. If you haven’t done a lot of this in other training, it is useful to write down training context as a hierarchy. Easiest environments first, then moderately challenging, then hardest of all. After you finish your list, break down what you’ve written into smaller and smaller units. Success is all about teaching your dog to win, and you have to make it possible for her to do so. Have you noticed that Steps 1-3 are all about planning? That we haven’t even started training a dog yet? Ah, but those steps are critical ones. Thinking through how you are going to train a new skill is as important as prepping a house before you put on the paint. It’s taken me years to beat it into my thick skull, but the time you take to think through how you are going to approach an exercise can save you massive amounts of time later. Of course, you have to modify as you go along. I thought that working in the driveway wouldn’t be that distracting for Maggie, but it was, so I immediately moved into the garage. But I only was able to do so because I had a hierarchy of distractions already in mind, and knew how critical is was to create a situation in which Maggie could win right off the bat. STEP FOUR: Now you get to start the fun part! Get your treats, easily accessible to hand out one at a time, and begin working in the context you’ve determined is the one in which it is easiest to get your dog’s attention and where you dog is 100% off leash. You may or may not work with the leash attached, but don’t hold onto it, lest you be tempted to use it instead of letting your dog decide on her own to walk beside you. Start walking around in erratic circles, and give your dog a treat every time she is on your chosen side (left is traditional and that’s the side I use just because…). When I begin I don’t say a word, I just walk around in sloppy circles and give the dog a treat whenever she is beside me. Be VERY generous with treats. For reasons I don’t quite understand, most owners have to be encouraged to give their dog a treat every time it is in the right place. (If you are worried about your dog’s weight, use part of your dog’s dinner for training.) The idea here is to let your dog learn to initiate the behavior by herself. At this stage I may prompt the dog on rare occasion (I smooched to Maggie when she first started to leave the garage before she got her first treat), but in general I let the dog learn on its own that it is really FUN to be beside you. There’s a video in my website’s Reading Room that illustrates Step Four. See Go for a Peaceful Walk (and enjoy the sound of the crunchy leaves).) You can use a clicker when the dog is positioned where you want her, click yourself with your tongue (like I did on the video) or not say a word, just deliver a treat. STEP FIVE: After several sessions of this, you are looking to have a dog who pays a lot of attention to you, and chooses to walk beside you much of the time in a quiet, non-distracting environment. I’m too impatient to never use any prompts–if a dog seems to be losing interest completely I might smooch or slap my leg a few times–but guard against using them very often. You don’t want the prompt to become a cue, such that the dog never learns to initiate what you want by him or herself. Once things feel like they are going smoothly, increase the level of distraction, but do so gradually. A common mistake is going from the equivalent of kindergarten to graduate school in one step. Look at the list of distractions that you wrote out from smallest to largest, and increase the level of distraction (thus, of difficulty for your dog) only one step at a time. For Maggie, tonight we’ll walk out of the garage into the driveway, but only about 10 feet max. If she does well then, the next session we’ll go another ten feet toward the barn. At this point I still won’t have the leash in my hand and I won’t use a cue yet either. I’ll wait to use a cue once I know that the behavior is well established at moderate levels of distraction. However, if I didn’t live in the country and my dog could only be outside on leash, I’d have the leash in my hand and do all I could to move around in any interesting way (NOT straight down a sidewalk in one direction, how boring!). STEP SIX: If you are ready to bet $10 bucks that your dog will choose to walk beside you 80-85% of the time in a non-distracting environment, it’s time to put the behavior on cue. I distinguish between a perfect “heel” and polite leash manners, so I’ll use a cue like “By Me” or “Left.” To put it on cue, get your dog’s attention, say your cue and move forward one step. If your dog moves along side, give her a treat instantly. Dr. Susan Friedman has a good article on Shaping a Behavior that includes good information about when to add a cue; check it out. Continue walking in an interesting way, and reinforcing your dog every time she is in the right position. Every time you move forward after stopping, say your cue and be ready to reinforce her with a treat if she walks beside you instead of in front of you. Pay attention to the context in which she succeeds and those in which you struggle, and continue to work toward helping her win. Remember that your job is to compete with the environment: It is always interesting and worth your dog’s attention. Are you? Remember too that people don’t have to be trained to walk side by side with you. Even if they aren’t paying attention to what you are saying (! ), they automatically walk beside you because it’s what we primates do. No so with dogs; it is hard work for them to walk beside us and anticipate every move while ignoring everything else. I won’t expect Maggie to have great leash manners for many months. She is young and exuberant and doesn’t yet have the emotional maturity to be able to stifle herself for long periods of time in a stimulating environment. But she is also killer smart and fun to train, so I expect her to make great progress. STEP SEVEN: And Step Eight and Step Nine and … This is the tricky part to write about, because it varies so much depending on the dog and the environment. This is also the stage at which people most often need help, so don’t hesitate to get a coach if you can. At least have a friend observe you–it is hard to know what you are doing while you’re doing it (if that makes any sense!) These next steps are all about gradually increasing the difficulty of the exercise while not going so fast that your dog simply is unable to succeed. For example, I’ll use a body harness for Maggie next time we go to the vet clinic, no matter how far we’ve progressed in her training. That’s one of the contexts that will be especially hard for her, so I’ll avoid a set back by using equipment to keep her from pulling on the leash. Basically, you want to gradually increase the difficulty of the exercise. As you do, remember to increase the frequency of the treats. Say your dog has been doing really well in the back yard, and you give her a treat every 12 or 15 steps. You should increase that to a treat every 2-4 steps for the first session in the front yard, at least until you are sure you still have her attention. 1. Not enough treats in the first place. Of course you eventually want to never use them at all, but start liberally and always go back to frequent treats when the level of distraction is higher than usual. 2. Stopping the dog yourself. You want to give your dog a treats as it is walking beside you, so don’t stop and unintentionally lure it around to the front. Watch the video in my Reading Room of me doing a first session with a young Border Collie to see how it’s done. 3. Making sessions too long. It is hard work to focus your attention on another when there are lots of other things to watch, smell and hear, so keep your sessions short. You are better off doing three 2-minute sessions a day than one six minute session. 4. Not understanding that the gap between a dog who walks beside you in a quiet environment when you have treats in your hand, and actually taking a long neighborhood walk with a dog who never pulls is large. How long it takes for your dog to learn not to pull is a function of a) how often you train, b) how good a trainer you are, and c) the dog itself. Some dogs are easy, and come as if uploaded with the requisite software package. Others are born to push into their shoulders and drag you across the county. Don’t despair if your friend’s dog is perfect with almost no training whatsoever; we’re all good at something and not so good at something else! Example: My Maggie. She learned to drop her toys on cue in one session. ONE. She learned to Sit on cue in two minutes. But anything that requires her to stifle her energy for more than a second or two is hard for her. After she sits she gets up. After she drops her toy she play bows and paws at me, or goes to get another toy. In addition, I find teaching leash manners boring. Important but boring, so I won’t work on it as often as I should. I expect it will be spring before Maggie behaves on a leash like I’d like her too. But that’s okay–the sheep are always calling to us! MEANWHILE, back on the farm: King Charles is back on the farm to breed the ewes, and we almost lost him yesterday. He developed pneumonia after leaving an enclosed barn and coming to our outdoor flock in unseasonably cold weather. Our great sheep vet, Dr. Jeff Kunert, didn’t hesitate to help on his day off, and set out the best antibiotics for him. Within just a few hours, King Charles, who had been barely able to walk, was eating and even bred one of the ewes, or at least made a valiant attempt. I’m watching him like a hawk now, and find him munching hay every time I check on him. Whew. Brrrr, it is cold. Really cold. No wonder the poor guy got sick. It was 4 degrees Fahrenheit this morning. (Did I mention that already?) Everything is relative, and we’re not winterized yet, so just about everyone is complaining about the weather. It is 17 now and breezy, and it still feels crazy cold. Like King Charles, if we’d had a chance to get used to colder temps it wouldn’t be that big a deal, but it was in the 60’s not that long ago. Jim got out the heating pad for the kitties this morning–I don’t think they’ve left since he hooked it up. Here they are, doing what all smart animals should do in this winter: Getting into bed and staying there til it warms up! I agree with you about leash walking being hard — this is probably one of the most difficult and frustrating behaviors for a lot of my clients because when many of them come to me, their dog already has a LONG history of pulling on the leash. I usually have people start out by taking their dog for “walks” in their living room. They sometimes feel silly doing it, but it allows them to practice the mechanics and get the behavior solid with very minimal distractions. Then, we can very gradually increase the level of distractions, until they are back walking their normal walk. Wonderful article! And so important. I didn’t walk my dogs (from my wheelchair) for many years because, well, it seemed impossible. Eventually I did make it a priority, and I was very happy with the results. Your point about looking at it as a trick from the dog’s point of view is brilliant, and very helpful–I wish I’d known that sooner! Thanks for the awesome training tips for leash manners. My 11 month old BC, Mason, who is a service dog in training, is difficult to walk without having a constant pull on his leash. This is the only area that I’m having difficulty with. He’s sooo eager to get where we’re going, it’s hard to contain himself. It’s even more important that I get this under control because now that we’re into the snow and icy conditions, I can’t have him pulling on me, causing me to fall. Using treats does help and I do see improvement in his walking recently, I think a light bulb has gone off, and he gets that he is suppose to walk by my side without constant tension in the leash. And your right it is like teaching a circus trick. The hardest part of this situation is the environment that we live in. We live in downtown Madison, on the 10th floor of an apartment complex, for elderly and disabled people. So, I have encouraged Mason to become friends with my neighbors, and he does, he LOVES everybody, but his enthusiasm is hard to contain when we’re in small places, like the elevators or hallways. Which we have to deal with around a minimum of 4 times a day. Plus, the apartment complex is working on the elevators, so we are down to only one elevator, which means, MANY people are cramming into the elevators, along with me and my two dogs (my other dog is a bichon). So, I really appreciate these training tips and will be utilizing them asap. Thanks again. You’ve reminded me I need to practice this more! One thing I did with my dog was to play Touch. I would ask for a Touch and have my hand in the spot I wanted her. I made sure I asked for it at random times (after one second, 10 seconds, 5 seconds, 1 second, one second for example). She loves this game. After she got really good at it I added a time element to the game so if she didn’t touch my hand in 3 seconds she lost out. She then decided to outsmart me by staying by my side so she always wins. I call that a win-win for sure! What sort of heating pad do you use with the ferals? I have a couple of ferals that I would like to have a heating pad, but am unsure of what to do to minimize the chance of fire. I love the timing tip from Laura. Priceless! And thanks Robin for the reminder about Kay Laurence’s argument about the 4 speeds of dogs. Very helpful. Ironically, I find that dogs do much better if I speed up, but I suppose it’s because I’m not good myself at slowing down! To Karin, we use a regular heating pad that I resisted for years because of your very concern about fire. We keep it on low, check it often for damage to the pad or the cord, and have it under a towel that is under the kitty igloo. I suspect part of the trick is to be sure that “low” means low. Some pads seem to get quite hot on low, but this one is only a bit warm. But it does help the kitties I think. (By the way, the cats aren’t feral; that’s the word for cats who live in outside the purvue of humans. 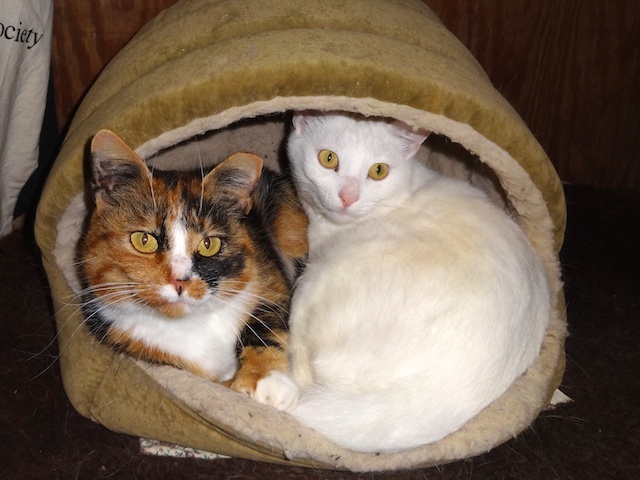 These cats, Nellie and Polly, are very much owned, loved and looked after. I wish they could be in the house, but my allergies prevent it. My 8 yr old boy Aussie/Border has never walked well on a leash, and he is the only dog that I started off walking him as a pup with a retractable leash all the time. He is very excitable/exuberant on leash- appearing to become more anxious as the walk goes on and he is asked to heel or follow- which he dislikes even more. We live in the city so off leash with a strong willed dog is not an option. He is great off leash in the backyard to listen and heel, but I notice when we go to the country to our property he always wants to be 6-12 feet ahead always looking back to see that I am still there, and sometimes I just turn around and walk the other way and within seconds he is running up and glaring at me as he again goes to lead! You have provided lots of food for thought, so I will be trying these ideas out on our warmer days. There are heating pads specifically rated for outdoor use, many people use them for feral cats. Ideally place it on a concrete surface. And of course read the warnings and instructions. Petco has a typical one, but most farm supply retailers will carry them. I’m going to stick my nose out, here, and say that I don’t mind my dog being out in front and keeping the leash taut. She’s about 20 lbs, so I’m not getting “towed”, and if she starts really pulling I’ll use a squeezing motion to encourage her to slow down (I ride dressage, so it’s the same motion I use to get a horse to stop leaning on the bit. It’s not rough, but doesn’t give them anything to “set” against). She’s a smart girl, and seems to have figured out that we get to have more fun and smell more stuff if she’s not towing me. And I like not having her under foot. Of course I’m sure it’s not quite kosher for dog training, but it works for us :). This is great stuff. I know first hand how important leash training is. When I lived in the city, one night at 11:00 my dog told me how badly she had to go outside. Living in an apartment with a dog who has the runs is no fun. So I quickly put on a jacket over my pjs and took her outside. She pulled me like crazy, which was her usual behavior since I was too lazy to teach her otherwise. She pulled me around a tree that had a small iron fence around it. I didn’t see the fence in the dark and fell sharply to the ground, breaking my arm. I actually passed out for a second and when I came to, there was my dog trotting down the street dragging her leash looking for a place to do her business. (So much for my loyal dog’s devotion to her owner.) Anyway, thankfully a doorman called an ambulance and retrieved my dog. That’s when I realized that bad leash manners are more than just an annoyance, they are a safety hazard. Fortunately my next dog was a natural on leash, but my second dog is not. I still have a hard time with him on leash, but I’m working on it and your tips will be a huge help. Thanks! Apartment dwellers: I have an almost 8 year old BBC (Brooklyn Border Collie). My first dog, a stray that I found and had for 17 1/2 years! taught me an elevator “trick” that I still use. We live on the 23 rd floor in a building with many elderly people as well as as untrained little yappy dogs and kids. Izzy’s routine is at the command “corner”, to go into the corner of the elevator that I point to and receive a treat or click. I always have a treat in hand when we get to the elevator – at least at peak times. It endears her to people who then overlook her attempts to herd them in the lobby. I also show off some of her crowd-pleasers like pressing the elevator button downstairs, saying hello (vocally – ha wo! ), waving etc. There are two things that I have found help my little mini Rat terrier walk better on a loose leash. Number one is pace. I am lucky that she is a very small dog, so a brisk “late to a meeting” pace on my side gets her nose up off the ground and gets her into more of a traveling mode. If I go at my normal pace, I might as well not be there as she stops every 3 steps to sniff something new and interesting. I will admit that my problem isn’t that she pulls to get to things, it’s that she stops and refuses to move forward until she has finished investigating whatever caught her fancy. The greyhound is more difficult on pacing, since there is no way I can move fast enough to get to her traveling speed. But a nice slow amble does seem to help her keep pace. The second thing is…. not holding the leash. And this is where I would love to get other people’s opinions, to see if I am actually experiencing what I think I am. Quite simply, I find the dogs walk better when I have them tethered by a waist belt than when I have a leash that I am holding. I suspect that that’s partly because hands are at the ends of these long things called arms, so the dog can never be quite sure exactly how far away they can be without pulling, since I tend to let my hand drift forward when they go forward, back if they lag, etc. On a waist leash, you eliminate that variable, and I think the dog learns “I can go X distance away without the leash being tight.” The other reason I postulate for why this works is that we use our hands a lot, probably without even realizing it. We gesture when we talk, we tense up when we get anxious, there’s that itchy nose to scratch, and heaven help my poor dogs if we wind up walking through a spider web! A lot of that is eliminated by attaching the dog to your waist. If people want to try this and see for themselves, a really simple way to try it out is to just loop your leash through a belt loop. I’d do this in a nice quiet low-distraction environment first, especially if you have a big dog, since I have had the greyhound get spooked and rip the belt loop off the pants. I’d love to see what other people think. Interesting post, as always. I’ve taught two dogs to walk without pulling over the last six years, and was struck by how radically different the experience was with each. I didn’t use food rewards for either, though, and I’m curious about how comparatively effective this approach is. When we trained Otis, food was off the table as an effective reward and we were under a LOT of pressure to get our very strong, very large dog leash trained as quickly as possible for safety’s sake. Since he came to us as a young adult more than strong enough to drag a grown man or seriously hurt himself or us with pure impact as he slammed into the end of the leash, we had to get it under control, fast. What worked for us was a combination of head halter (which he HATED but which enabled us to safely control him while he was learning) and stopping. Simply put, I prompted him into position beside me as we walked on a shortened but loose leash. If he pulled to the side or got ahead of me, I planted my feet and stopped moving. I then turned in a circle, encouraging Otis to circle around and move back into position beside me. I carefully maintained a patient attitude (I would sometimes say, out loud, “I’m sorry Otis, but I can’t walk while you’re pulling me.”)The second he was beside me without tension on the leash, we moved, often in the direction of the object of his interest. Out of position, tension on leash, stop, circle, repeat. Getting to the tree/sign/poop he wanted to approach worked as the jackpot, forward motion as the small reward. When we made it to the goal, I’d drop the extra loop of leash, and let him sniff and wander as he wished for a few minutes, only reacting if he really slammed against the leash, in which case I’d just plant my feet, and ask him to return to formal walking position before heading in the direction he wanted. When I was ready to move on, I’d prompt him to return to position, shorten up the leash, rinse and repeat. It took about two (dizzy) weeks to really get the idea across, but once he started improving I started taking his head halter off, and only replacing it if he started acting up. I didn’t intend it as punishment, just as a safety measure, but I suspect he might have interpreted it that way. Regardless, he started improving at light speed. Four weeks in, he wasn’t wearing the halter at all. Three months in, people who saw him in his winter coat were asking if he was a service dog. Six years in, a toddler could walk him. Sandy, unfortunately, has been the victim of our laziness and her generally excellent behavior. She has never been VERY bad about pulling, and since she’s physically controllable, being smaller and not a hard puller or sudden slammer, and since the lion’s share of our time is spent off-leash, I’ve simply never bothered to teach her to the same standard. She has made progress, to be sure, and I can generally walk her without any real effort. If I really insist and get her to focus, she is CRAZY good- the most stunning moment of my dog-walking life occurred as I was walking Sandy along a city sidewalk, asking for a focused heel, and watched her as we passed another dog (dog next to dog, coming the other way on a narrow walk) and she passed him without even turning her head. (The other dog was super impressively well-behaved himself, though he did turn his head a bit to glance at Sandy as she passed within inches of him). Still, despite her moments of mind-boggling brilliance (Otis could never have done that passing without a head-turn, thing, ever). Sandy is prone to lapse in ways that Otis is not. If she’s not in the zone, she’ll start edging forward, working up to forging ahead. If I ignore this, she’ll go right to the end of the leash and start pulling. She’ll also forget and pull on the leash when we’re milling about rather than stopping and waiting when she starts to feel tension, as Otis does. I’m sure I could work on this, and probably should have before now, but it just didn’t feel like much of a priority. So thanks for the reminder that leash manners can be part of “fun” training rather than a chore. I wonder whether going back to square one might help my ‘circus trick’- loving dog develop a more permanent sense of leash manners as a default behavior, the way that Otis has. I’m particularly interested to hear about others’ stories and tips for refining this behavior in dogs who have it down most of the time. For dogs that live on farms and seldom travel off the property, I can see how leash manners are a “nice-to-have” skill…but going to the vet, or camping , or visiting, they become very important. Reminds me of learning to parallel park when I was a teenager in the Adirondacks…I wondered, “When am I ever going to use this?” Then I went to Albany! So, I guess leash-walking is the parallel parking of the dog world…certainly a must-have for he urban canine! Great, helpful article, especially with my Active Abby! I haven’t perfected it (by a long shot.) But I’m working on explaining there are 3 different positions. A (short term) focused heel, a loose leash ‘stay close,’ and a separate cue for when she’s allowed the freedom to be out in front of me, – so long as she’s not pulling. Leash manners are something that we constantly struggle with, and I will admit that it is all my fault! We don’t have a fenced yard, so my Aussie and I take lots of walks. We do work on her walking beside me, but when dog walking is a must, is it okay to only practice leash manners for part of the walk, and then let the dog walk her normal way for the remainder? I always worry that I’ll be undoing all of our hard work during the “free” time, so I end up not practicing manners at all! Thankfully with the use of the Easy Walk harness, she doesn’t really pull most of the time. Thanks for the great tips!! I used an out door approved heated pet pad one winter for a young rambunctious cat who was way, way too busy inside during the night. He stayed in an enclosed back porch on the middle shelf of a repurposed baby changing table I picked from a neighbor’s trash. I placed the hood for an out of use covered kitty pan over one side of the pad which had a fleece type of removable cover. In addition, the back, side and most of the front of the shelf were lined with cardboard and “seams” at corners sealed with old toweling. He was snug as could be, had a kitty pan handy as well. He then came inside the house during the day. One also can find instructions for making insulated nesting boxes for truly feral cats if there is no suitable place for them to live. Don’t of course know where Karin lives, but Farm and Fleet in WI sells these mats and may have them on sale now. Price is around $40 for one about 17″ x 28 or so. When our Entlebucher Mountain Dog, Inga, was a puppy and learning leash manners we carried all sorts of small treats, but for really distracting situations we used a wooden spoon covered in peanutbutter. I would carry the spoon in a ziplock bag (sealed around the handle) in my fanny pack until we needed it. Then I would get it out and if she was right at my side I would hold it in front of her face and let her lick it. Then I would lift it up high and carry it – if she stayed at my side or moved away and then returned, I would give a verbal marker (like yes or good) lower it again and let her lick it. This worked great! We even used it a few times in puppy obedience class if she was really distracted. Thanks for the guidance, including both the importance of planning as well as problem solving (wow, yeah!). When I first worked on leash manners with my two dogs, my criteria did not include loose leashes on inclines. So uphill and downhill the dogs were allowed to tighten the leash. I reasoned it was so much easier for them and their four legs and… I didn’t mind the help being pulled a bit up steep hills. Since moving to a very hilly area, however, I definitely regret my earlier choice. There is little flat land nearby and unless I want the pulling to continue, I’ll be starting from square one with dogs whose previous definition of loose leash walking was limited by the terrain. I’ve been putting it off and keeping them mostly off leash, but this puts me in the right frame of mind. Also I am a planner and can get stuck in the planning phase for a while. So I have a question. I do use a harness for my Aussie, but I’ve decided it is high time for him to learn loose leash walking (he’s now 6.5 years old). I have to walk him on leash to reach off-leash areas, and anywhere immediately off our property. I sometimes do not have the time and energy to work with him all the way up the road, and would like to just walk along using his body harness. Is the context between a lead snapped to the collar versus a body harness clear to a dog? Will it make sense to him that we work on loose leash manners whenever he is on a lead, but he can move ahead if he’s wearing his harness? Good question too liz, about the impact of using an extra high value treat while training leash manners. I agree about the jackpot… would just gum up the works, but I don’t see why using an especially great treat for especially great performance would hurt, and might do some good. Why not extra good for a longer duration? Or in the context of more distractions? Kari: Love the peanut butter spoon! Thanks for that great tip. To em: I suspect we can never lose by going back to the beginning of any exercise. How much would it help Sandy? Hard to say, but it’s a great place to start. Then reinforcing her when you can predict she is likely to lapse? Perhaps this is a good time to mention that I too am a lazy heel/loose leash trainer? My dogs are on leash so rarely that I accept pretty sloppy responses, at least compared to what I expect after I say Whoa, or Lie Down, or Wait. Willie doesn’t haul me around, but neither does he have a perfect heel. Maggie came, however, as if trained as a sled dog, so I really do need to get my act in gear. We had a good session this morning: These comments are good for me too; they are keeping me motivated! Rebecca, and not holding onto the leash. You are so right that it is hard for us to not use a leash if it’s in our hands! Years ago I showed video clips of people jerking the leash interspersed with chimpanzees snapping vines around. Give a primate a long, skinny thing and he’ll pull on it! I think leash attached to your body can be a great idea for small dogs BUT, I’ve heard of some serious accidents with people’s bodies being attached to larger dogs. Even a medium sized dog could pull a person off their feet, or injure their back badly. It’s always something, right? To Tony: The elevator trick is brilliant! Thanks! To HFR: OUCH! A broken arm? Oh dear! So glad your dog wasn’t injured too. But thanks for sharing you’re story–motivation for us all! I just posted a blog about loose leash walking a couple of days ago, so I’m really pleased to read your article. I think your method is great, especially for puppies. Teaching older dogs to walk calmly on leash is the thing I’m asked most often to do in private lessons. I start out in the house, putting a hot dog cut into 5-6 pieces on the floor about 10 feet away and then walk toward it with the dog on a leash. As long as the leash stays loose, we move toward the hot dog. If the leash tightens, we back up 3-4 big steps, wait for the dog to be ready and then start again. When we do, at last, reach the hot dog pieces, the dog gets to have all of them and the training session is over. I gradually increasing the distance to about 20 feet before trying to to this in the garden. Out there, we go back to the very beginning, with the hot dog 10 feet away. At 20 feet, we graduate to the sidewalk outside the house and start over, again. The only rule is that the dog must keep the leash relaxed. That is, the leash clip is hanging straight down from her collar or front-clip harness. She can pause, sniff something, look at something or do whatever she likes as long as the leash stays loose. When she’s able to walk half a block with a loose leash, we go back to normal walks, but the rule is the same: the leash has to stay loose. Eventually, I may walk a dog on a 30-foot long line if we’re somewhere without too many pedestrians (silly pedestrians seem determined to get tangled up in long lines!). Over time, the “goal” shifts from hot dogs to the chance to chase squirrels or whatever else the dog really wants. One big advantage of this method is that, when working with large dogs, they’re not as likely to be distracted by treats I may be carrying: I don’t have any with me. The hot dog is the goal. This seems to help the dog learn to have good self-control more quickly since there’s no point in mugging me or jostling me in case they might get a freebie. I do lots of work on dog Zen, but this leash-walking method doesn’t have to include it. First, I really appreciate your willingness to share your training journey with Maggie and your other dogs. As a trainer, I often feel that others expect my own dog to be a model of perfect behavior, so a very big thank you for your openness about how your dogs are also works in progress. I think with loose leash walking the devil is in the details. That’s why what I found most helpful was your emphasis on the need for planning. For example, most of us are aware we should raise the distraction level gradually, but when it comes to putting this theory into practice, how many people fail to make a systematic plan and then find themselves in situations where the distraction trumps even their high value treats? Likewise, I have used both no pull harnesses and head halters, but again, it takes planning to avoid either crutching on these tools too long (assuming you don’t want to use management as a permanent solution) or transitioning off of them too abruptly. Effective use of treats is also not simple, as care must be taken to give effective reinforcement, yet also not to dull the dog’s appetite prior to the end of the session. One area I would really like to learn more about is how to make the best use of timing of reinforcements when training both loose leash walking and formal heeling. Bob Bailey says it’s best to use continuous reinforcement schedules whenever possible and don’t go to a ratio until the behavior is fluent – but that you need a variable schedule when you want a lot of responses per interval, or a persistent behavior without frequent reinforcement. My dog has been responding well to something I just recently started trying out which is reinforcing her each and every time she is able to take a fixed number of steps without pulling – and when I get that behavior at least 5 out of 6 times, I raise criteria and add another step. So it goes, 3 steps, click/treat – repeat 6 more times and if successful, raise criteria to 4 or 5 steps click/treat, repeat 6 times, raise criteria and so on. I love this post for a couple of reasons. One is that I, too, am really terrible at teaching leash manners because I find it so boring and have a high tolerance for pulling dogs (mine are not huge so that helps). And two is that I used almost exactly the method you describe in training Jack, without ever having read it somewhere first, because I knew I needed to be creative. Unlike most puppies I’ve known, puppy Jack was not terribly concerned about staying close to his people. He was a brave, bold puppy prone to wandering off (we brought him home from the breeder at 10 weeks. He was in his crate in the car for two hours. I carried him into the backyard, put him down, and he promptly trotted to the front of the house and started to head up the street to see the neighbor. Things just got worse from there). And therefore he needed to be on a leash pretty much from day 2 of being here, when he was much much too young to be expected to walk anything like nicely. And so by the time he was old enough to learn leash manners, he had some terrible habits associated with the leash— zigging and zagging, pulling, playing tug, and on and on. So I thought “No way I’ll teach him to walk nicely with a leash ON”. And I promptly took him down the basement and taught him to walk in more or less heel position without a leash. We made it a game and changed direction and speed frequently, with lots of treats and increasing level of difficulty. Since he was herdy as a puppy, having him stick close by my feet while I changed direction and speed rapidly was great fun for him and self-rewarding, and the treats were a huge bonus. The hardest part for me was to learn to treat from the side so I did not pull him out of position. Once he had that down, I clipped on the leash and went back to the beginning with him dragging it. I repeated all the steps, and only then did I pick the leash up, and again went back to step one. Once he had THAT down, I would take him out into a big field (after he was exercised) and went back to the game with no leash, then added the leash and had him drag it, then picked up the leash. This was a field he already associated with training time. Only after that did I add it to walks. On walks I would only ask for heel after he had sniffed and pottied and burned off some energy, so about 15 minutes into the walk. And when it came to approaching other dogs on a loose leash (because he loves to socialize), I resorted to luring and that was a lot more work. I really had to treat it as an entirely different training tactic, since he failed to ever see it as an escalation of increasing distraction from the original training. Introducing a friendly dog to the exercise was just too much for him. To this day, he heels much better off-leash than on, a clear sign that my own fairly lazy leash habits are the primary factor whenever he blows me off. “Leash off means pay attention to mom; leash on means I can do what I want” is the expectation I myself set. Maddie was super easy. She came to me as a retired show dog and already had power steering, though she didn’t heel in the traditional sense. She learned to heel by watching Jack do it. @ em: Your method can definitely work, but not for me! lol The reason of course is that intermittent reinforcement is the strongest type of reinforcement, and using the “we only move forward if you don’t pull” method really only works well if the handler is committed to following that rule 100% of the time. Reward the dog for pulling just once and the task becomes that much harder. And I am much too lazy a trainer to reinforce anything 100% of the time. What a timely post for me. I just recently decided that after 6 months of owning her, I need to really work on leash manners with Allie, my young cattle dog. She was doing okay in our neighborhood on leash (and is fantastic off-leash when we are hiking) but then one of the neighbors made himself very exciting by screaming at us because his dog barks at us whenever we walk past. Walks have been somewhat dreadful ever since (go figure). I like the sloppy circles idea, in particular. Like Maggie, Allie is young and exuberant but clever so I expect we will resume making good progress to good leash manners, but you’ve given me some new tricks to try. Your point about not using the leash is really good- I tried for over a year to teach my male dog to heel and just could not get him to understand until one day when I grabbed his Kong Wubba and headed outside (we lived in the country then) without even his collar on him (he has a great recall) and worked. He heels beautifully now, but that leash was really preventing us from communicating effectively. In fact, he and I still do better without the leash for obedience work than with the leash. I walk all three of my border collies together on-leash every morning. They are out in front of me, but do not pull. They have learned the command “easy” which is particularly helpful when it’s icy. If anyone decides to get too energetic and I feel tension, I simply stop. They look back at me and then at each other as if to say ” Hey, what did you do?” I do walk pretty fast which probably helps prevent any pulling, but stopping really seems to make an impression. I participate in competition obedience, so my two boys know heel as a very specific command. When we take a walk, I don’t ask for them to walk at heel because of the context. Besides, I want our walks to be a time for all of us to enjoy being outside together where they can smell the roses and I can enjoy their company. We also enjoy heeling during training sessions because I have worked hard to make it a fun exercise. Love this topic. Walking your dog is a kind of negotiation, and I have struck a different bargain with each based upon his/her personality. One of my current dogs sounds a bit like Maggie: pretty high energy and not a ton of patience. She simply cannot walk slowly. One thing that has also helped is teaching her the “go sniff” command. If we get to something she really wants to check out, she will look me dead in the eye and if she has been walking well and there’s no reason she can’t take a look, I will reply “go sniff”. If not, “keep walking”. It provides her a built-in reward. If I buy your plane ticket, will you come an explain this : Note: The hands-down winner of the “Doesn’t Work” category is jerking on the leash when the leash gets tight.) to my husband? Yup, we have two avid pullers and me trying to train with them and him applying the above mentioned technique is … hum… counterproductive? Well anyway, I re-started training not pulling when I hurt my back and what I mainly do is start the walk with them besides me and during the walk, what works with Spot is me stopping when he start pulling, then clicking and moving forward. The moving forward is a much bigger motivator than the treat. By the way, as an addition: we have noticed that the dogs pull less when we use a hip belt I think mainly because the counterproductive “pulling back” is more difficult for the human to perform. Furthermore, I think we made a mistake when we used bungee-leashes when the guys were very young. I was so used in using one of those, because our first husky was a dog that pulled on principle that unthinkingly I used the smash leashes for the pups. IS using a bungee-leash counterproductive? And how? Perhaps because I do not feel the pulling, thereby making me lax in training? I woud appreciate your thoughts on this. Love the walk talk! I am a DogLife skills Instructor (“trainer”) who is determined to come up with the simplest and fastest method of teaching dogs what we mean by “walking.” Ten years in, I’m almost there with a concept called OneStep Walking. Lots of help from my own dog Tawny, who was basically a rocket attached to a leash. She now is a great walker most of the time, so she gets to wander rather than walk because no matter where she wanders, if she feels any collar pressure she immediately releases it herself. This comes from hours of experimentation; my last go-round was starting from scratch with a different word. This created the best walking ever, so I would like to encourage people with longtime pullers to consider changing the word you use so you have a “blank slate” on which to write a new definition. Context really is king. I can see how for your farm dogs who spend most of their lives off leash leash manners aren’t critically important but for my suburban dogs that can’t go anywhere outside their yard without being on leash having good leash manners is essential. If I’d known then what I know now I would have taught Ranger differently but on the principle that the thing he wanted most was to keep moving we spent two hellacious weeks teaching him the equation pulling on the leash = stopping. If he didn’t pull we could walk for hours and he could sniff and explore but pull and it was dead stop until tension was off the leash. We both hated walks but today he has beautiful leash manners and I’ll often walk him with the end of the leash draped over my shoulder or hanging across my forearm. When we adopted Ranger as an unruly teenager the leash I bought was called a traffic grip leash; it has a handle at the six foot mark and a handle right next to the collar. Whenever I was concerned that he wouldn’t behave I’d hold the traffic grip so I’d have better control if he decided to bolt or something. I didn’t set out to train it but today we still use the traffic grip leashes and whenever I hook a finger into that handle Ranger knows to heel. I describe it as the equivalent of holding a toddler’s hand to keep them close. When we visit nursing homes and the like I often want him close so I ‘hold’ the traffic grip. It’s so much easier than reeling him in or calling him back when he needs to be close. By the time we adopted Finna I knew a lot more and have taught her leash manners in a fashion much closer to what you outlined. We’ve also used the wooden spoon although we coat it with moist dog food and freeze it since that’s a lot less messy than peanut butter. Finna came to us with collar use completely poisoned. Raised by animal hoarders I suspect that the only times she’d been on collar and leash had been when she was taken to the vet to be spayed and when she was surrendered to the Humane Society and consequently in her mind leash attached to collar could only result in something terrifying. She fought having a leash on her collar to the point I thought she’d injure herself. So she learned leash walking on a front harness while we retrained a collar. On the advice of our wonderful trainer we would touch the collar, click and treat then we progressed to holding the collar lightly and briefly mark and reward then lightly tugging the collar as we held it and if she turned toward the tug mark and reward. Today I can walk her with a leash attached to her collar or using a slip lead but she prefers the harness so we mostly use that. On the slip lead Finna does pull slightly but that’s also a trained behavior since after her knee surgery the vet wanted her to exercise it but she’s so high drive that letting her off leash was not an option. So she does recognize different rules for different gear. Never is she allowed to pull me to the point where she’s in dragging me but on the slip lead she’s allowed to keep a constant tension on the lead. Of her own accord Finna has developed her own style of heeling. After being ahead for a short while–basically while she’s excited about going for a walk–she drops back to where her knee parallels mine and walks with me I started out trying to teach a more traditional heel but since the goal is not obedience competition but a dog that can stay with me politely on a walk I’m satisfied with what she chose. When we finally conquer her reactivity she’ll be a delightful walking companion. As I’ve mentioned before, my extended family has always had border collies and BC mixes, many working dogs on working farms, so I’ve known a couple hundred over my lifetime. Many border collies, although certainly not all, seem to become hypervigilant, even anxious, when they’re on leash. The same dogs that are brilliant at shepherding, search and rescue, or agility, start dancing around like chihuahuas with someone leaning over them once they lose the ability to put space between themselves and, well, pretty much everything else in the environment. Thinking about what did eventually work with her, I’ve realised it was exactly what Trisha described in her article as teaching it like a trick. Assuming it would feel weird and unnatural to the dog until we had communicated very clearly exactly the parameters we were looking for. We actually started with a modification of Ian Dunbar’s method where you use no leash at all to begin with, and just teach placement. I did this because she was a crossover walker, crossing back and forth in front of me, and it was really dangerous with my wheelchair. So we began in the house, no leash, and worked until she was comfortable staying on one side. But as soon as we put a leash on her, she went from happy and energetic to tense and irritable, even though her relative position was exactly the same and the leash was loose. Hyper vigilance is the best description I have. And again, something I’ve seen in lots of bc’s. But we got through it eventually, and I now realise the more I got her to conciously think about meeting specific criteria (Trisha’s ” circus trick” mentality), the more she relaxed into it. Now she’s fine. But I did just want to mention the space management anxiety since a couple of people have mentioned BC’s. I think it all makes sense when you look at how bc’s work and play, but I also think the “circus trick” approach may be an ideal solution. With ice-slicked roads in our neighborhood, I am so glad that “reactive-recovering” Habi now has good leash manners. It only took us four years to get there…(one of her many gifts to me was unlimited patience). We didn’t walk her for the first two years (ages 3 to 5); we spent that time working on impulse control and dealing with her many triggers. Once I thought there was a chance she could think outside the house, we spent the next few months progressing from “get to the first neighbor’s driveway and turn around to go home” to eventually “get to the end of the block and come home”. She is neophobic, and outbound was always much more fraught than the return; for a year we only did out-and-back so she’d be comfortable in the return portion of the walk. I was never so proud of her as the day we chose to walk around the block, instead of out-and-back, and she could do it happily! One hint: parking lots at 6 a.m. are great low-distraction outdoor training places, especially if your own neighborhood is toxic with triggers. To make a very long story short: now we can cheerfully walk almost anywhere, and people often comment “Oh, what a good dog!” I cannot tell you how proud I am of her, and how far she has come (with the help of a behavioral vet, drugs, positive trainers, and a lot of information from books and blogs). She trots ahead of me almost at the end of the leash, able to explore at will as long as she doesn’t pull, and over the last few months she has chosen to spend more and more time at my side. The only place I ask her to “follow me” (aka heel) – and even in the worst of times I asked her for this – is to cross streets. As she has had a billion reinforcements of this behavior, she is very reliable, and it saved us from the potential of slip-and-falls today as we tiptoed across the icy streets to the not-quite-so-treacherous sidewalks. We still go through tons of treats on walks, and I expect we always will. BTW, I attach her leash to the belt of my treat-bag, worn low on my hips. For us, it was harder for her to jerk away from me and/or pull me off balance in the bad old days, and much easier to handle clicker, treats, toys, poop bags, etc with two free hands. I might have done things differently if she were larger than 35#. I quite agree about the dangers of waist leashes. Simple physics tells us that 4 points of contact and a lower center of gravity tend to win out if the two want to go in different directions. Holding your hand together at your belly button would do the same thing, but is not a very natural position for us to be in. And I am sometimes amazed when I realize how much I fiddle with my leashes! I am a very tactile person, and find myself running my fingers along the leash just as a matter of habit. Put something in my hands, and I stroke it. Do you think it would be possible to do a blog on the other problem with getting dogs to walk on a loose leash? Almost all the advice I can find about how to get a dog to walk nicely on leash starts off with the assumption that the dog is pulling and darting all over the place, and the goal is to basically get them to slow down to our “slow as death” pace and stay nicely with us. But there are those of us who have a different problem: the dog simply does not want to move. For various reasons, although it generally seems to come down to stubbornness or fear. Pixie, my rattie, walks along great on a loose leash. Until we stop somewhere with something interesting, or her nose catches scent of something extremely intriguing, at which point she plants her feet and does her best to become one with the earth. For example, the dried earthworms that you find on sidewalks are one of her favorite treats. And when trying to walk down the sidewalk at certain times of the year, she will fixate on them and refuse to move. If I stop, she is more than happy to eat her way to me on a loose leash, and walk on a loose leash eating them until she gets to one that is stuck, at which point she plants herself and we have the same problem all over again. I feel awful trying to pull her until she moves, since I can hear her claws scraping from where she is frantically digging them in to stay in place, and most often, I will resort to just picking her up until we get to a worm-free area. But I haven’t found any reinforcer that can compete with a buffet of (in some case) hundreds of dried worms. Katie, on the other hand, does the famous greyhound “statuing” when she goes over threshold. Which happens unpredictably, since she has generalized anxiety. She goes so far as to cross her front feet, so if you try pulling her forward, she’ll trip. At 56 pounds, picking her up and carrying for more than short distances is not really practical. Where this really becomes a problem is when she has happily walked in one direction, but freezes when I want to get back to our starting place. For example, on a hike that is an out-and-back path, where the only option to actually getting to the car is to go the direction that she doesn’t want to go. What do you do with a dog who is a half mile from the car, and is simply refusing to move in any direction? Of course, being over threshold, even my high-value treats are not enticing at this point. And then there are the dogs that I have heard and read about, that just sit down or lie down and refuse to move, for whatever reason. I have found very little advice on how to convince dogs like these that walking (much less loose-leash walking) is an enjoyable thing. And, it becomes a bit of a vicious cycle, since if they freeze up, and you force them to move, you have made being on the walk less enjoyable, which seems to logically imply that they are going to be even more reluctant to go the next time. This is probably outside the scope of this current blog about making walking fun, but I thought I would throw it out there for future consideration. I just discovered your blog it was passed on my way. Loved your post it was both informative and straight forward. With my years of canine walking I agree with your tips.Certainly the body harnesses can be a valuable tool for pulling dogs. I like using the Easy Walk or Freedom Harness (this one has two options either clippping onto the chest or on the dog’s back) The Freedom harness has a soft belly strap which can prevent chaffing 🙂 Positive reinforcement goes such a long way when working with a dog learning leash manners. Keeping training sessions shorter too allows for more opportunity for success without both human and dog getting frustrated. Unfortunently I still see people using prong collars to “manage” a pulling dog.It breaks my heart when there are other options and they are not willing to explore them. You have a new follower from Toronto! I am pretty sure that you’ve tried every easy and practical trick that I know to get past the planting and freezing, but just in case, here’s my two cents worth of experience: Sandy’s constantly forging ahead so no problem there, but Otis used to stop and plant when he wanted to sniff something or freeze when he would fixate on an approaching dog. Jogging worked with the first, especially if I knew a “hitch point” it was coming or if he was just in a mood and stopping every ten seconds. Running would keep him moving forward despite appealing distractions in almost all cases, and it just sort of broke the habit. With Otis, I have to run at a fairly good clip to get him to break into a trot, but with smaller dogs, sometimes just power walking is enough to get them to up their pace enough to keep them moving. Though I would never advise setting your dog up to do it on purpose, and have always made every effort to avoid doing it, every dog I’ve ever owned has rapidly learned not to suddenly stop or cross in front of a running human after getting run into or hitting the end of the leash harder than they were expecting. Unlike deliberate yanking or popping on the leash by frustrated humans, these accidents, though doubtlessly aversive, actually do seem to get the point across. Fortunately, my healthy, emotionally resilient dogs have never held them against me. As I mentioned in several blog posts back, Otis used to freeze in an over-threshold sort of way, too, and what worked for me was using his release cue. I’ve done similar things with dogs who don’t want to walk forward, and sometimes I have been able to trick them by asking for a sit or down stay, backing up in front of them in the direction I want them to move, then releasing them to come to me. Once they’re up and moving, I RUN, and running helps break down the freezing tendency even more. I had a friend who had an active, healthy young corgi who did not want to walk more than a block from her house, and would plant her feet and refuse to go any further. She was in no way actually tired or sufficiently exercised and mentally stimulated, nor was she generally a fearful or neophobic dog, she just had a hangup. My friend would pick her up at that point, or just go back and let her play in the yard, but when I was dogsitting, I found that if I started running a few yards before her stop point, I could just sort of blast her through it. The first few times she did stop and try to turn back. I stood at the far end of the leash, called her, put a little tension on it, though I didn’t pull- I just didn’t allow her to move backward- and waited her out. She hesitated, but since we were already past her no-go stop, she seemed to be uncertain rather than determined, and after a long minute, she took some reluctant steps forward, followed by less reluctant steps, and eventually just resumed her normal walk. We went on for a couple of very high value miles (lots of park time with frolicking and plenty of good smells) which she obviously enjoyed. She hesitated less and less at her “hitch place” over the next two weeks, and I though I still had to bluster her through at a fast walk, it started getting less and less noticeable, and I’m fairly sure that it would have eventually extinguished, or at least remained manageable, since she only displayed this behavior at that particular point, never elsewhere during her walk. When her owner returned, however, she went right back to her old habits, and her owner went right back to never walking her more than a block, which I found terribly sad. Once the dog can do that for 10 or 12 sequences indoors offleash and seems to be enjoying it, add the leash, still indoors, still in a safe place. Then indoors with the window open. Then indoors with the dog on leash and the door open. Then just outside the door, with the door still open to the house. Then very, very gradually moving outwards. Eventually you hopefully get a dog who responds as McDevitt describes in her original protocol, one who is able to relax into the pattern and ignore pretty much anything else happening elsewhere. With a strong reward history for the Play! you can get the dog to unfreeze, and then using the 1, 2, 3 creates a safe zone for the dog to stay in mentally. McDevitt’s point, which is interesting, is that many dogs find the 1, 2, 3 more engrossing, and hence more calming, than just feeding a dog a treat every step. Because they have to think a little bit, and because, as she says, “Dogs love knowing what’s coming next,” the pattern game becomes a comfort zone for the nervous dog. I think this all lines up with Trisha’s point about teaching loose leash walking as a circus trick, even though McDevitt is dealing with very different issues. The trick approach keeps the dog’s mind engaged and gives them a specific criteria to match their body to. Anyway, just something to consider in case it gives you any more ideas. Silly silly me, realized that re: dog stopping on walk, I forgot to say we had smell on cue. So when starting a walk or rewarding with smell breaks, i always used “smell” to designate the opportunity. Taught “smell” first in almost no time at all, hoping that it’d be like putting an unwanted behavior on cue to better control it (like barking). Instead came to use it for reward opportunities only. I agree that dogs who won’t go forward are an entirely different category. Thanks for the reminder: Sort of like very thin people who struggle to gain weight get overwhelmed with the whining of the rest of us who can’t lose it. But both are indeed problems. I’ve had the most luck with teaching a “forward” or “let’s go” cue inside, as Robin suggests, one step at a time, with few distractions. I’ve also used that old time horse trainer trick of walking in circles. If the dog stops and won’t go forward I’ll walk toward and in front of it, making a circle. If you complete the circle lots of dogs, like horses, will continue walking forward with you. But if the dog is truly frightened, then we need to be talking about counter conditioning. Yup, deserves its own post! My Jack can be a horrible lagger/balker, not because he goes over threshold or freezes but because he has a different agenda than I do and definitely has an “I’ll take what you say under advisement” attitude. He thinks lots of things are negotiable. Someone gave me the tip to hold the leash in my right hand (if the dog is on the left) and let the slack drape in front of my thighs. If he lags, my legs bump the leash and it encourages him to keep moving. I do give him chances to sniff and sometimes let him choose which walk we will take. But this method works better than pulling, clucking, treating, encouraging, or whatever for a dog who really just wants to do his own thing. When I posted my first reaction I did not read all the others, so I would like to add a comment about using a handheld leash vs a hip belt. With my pullers, who can also be lungers, I prefer a hip belt with a bungee leash, especially because of sudden movements. If it is better or not, to coin Trisha’s phrase: it depends. In order to safely use a hip belt (in my view)first of all it should be around the pelvis and not above. Many belts have a tendency to slide upwards or sit around the waist. If that is the case, a sudden pull pulls you forward and gives undue pressure on the spine. Second, the person using the belt should be used to using the stabilising muscles there. Sadly, not many people are ;-). Look at a person walking: how many people walk with moving their leg forwards, bending in the hip? Most people I see walk with swinging their legs outward, creating rotation in the lower half of the spine. The centre of gravity and power in the human body is in the pelvic region (core stability, also known as “hada” in f.i. karate or in yoga “mula bandha”) but if you do not know how to engage those muscles, than 50 kilo powerful dog in full swing does give pressure on the spine ;-). On the other hand, power and forse are not just kilo’s but momentum also plays a large role. My dogs are fast. The only time Spot managed to pull me over was when I was holing the line in my hand, not paying attention to him and him making a full sprint because of seeing a rabbit. At that point I think he weighed 20 kilos, but he caught me by surprise and created and my arm functioned as a lever. I was lucky, landed on my back in the snow and wasn’t hurt, but a friend of my mothers with her labrador in a similar situation landed on a curb and had a skull fracture. People have even been killed by dogs pulling on leashes that were held in a hand. For those who are interested: I currently use a Canadog canicross belt, which has the added benefit of being able to attach a dog on the side as well as in front. This is probably also another blog post entirely, but I find @Robin Jackson’s comments on BC’s interesting. I’ve always wondered why BC’s are not the leading breed for service dogs. With their intelligence and drive to work, you might think they’d be great at that. And I’ve thought maybe it’s because they are herding dogs, but GSDs are commonly seen as service dogs. But her comments may explain some of that. Having space issues and anxiety over proximity of people and or objects is probably not the best qualities for a service dog. I’m sure there are plenty of BCs that are service dogs and do a great job, but it might just be a tad more difficult for them. I have one who occasionally planted herself for no reason that was apparent to me. Trainer suggested me walking to end of leash–being careful not to pull her–then squating down and asking her to come, then lots of happy praise and petting. She LOVES to come and give me ear licks and get pets, and once she makes it those three feet, she is then happy to continue on. At least for her, it is just breaking the cycle or making her forget why she wanted to stop or ???? I don’t know why it works, but it does for us. I actually don’t think it’s good to walk a dog on a leash attached to a collar regardless of whether it pulls or not. I use a T Touch harness. It has front attachment and three points of attachment on the back so you can attach a double clip lead at different positions depending on your dog. They are brilliant and has been the best harness I have purchased. Lot’s of clip fastenings mean that it can be adjusted so that it doesn’t have to go over your dog’s head, which some dogs don’t like too. Two points of attachment seems to make my dog move in a much more balanced manner and it’s very difficult for the dog to pull when a lead is attached to the front of it’s chest. Given the problems a lot of dogs have with leash reactivity, it takes away the presure on the neck too – they’re great. I just had the most awesome loose leash walking training session ever (with my dog on a buckle collar) and wanted to share what I found worked so well. Although there are times when my high energy Border collie wants to pull toward a person or another dog, most of her routine pulling on walks or when we go to dog class or shopping at Petsmart, etc. is to sniff at various distractions. Addressing that problem is the basis for this stage of my training plan. There is a prerequisite – the dog should already have some reinforcement history for walking by your side in a low distraction environment and understand a verbal cue for this behavior. So this is about how to get from that point to teaching more impulse control in higher distraction places. Today I put her breakfast kibble in a treat pouch and headed out down the block. This is an area with sidewalks and grass where lots of dogs are walked so there are plenty of smells that create pulling distractions – I would rate this about a 7 on the distraction ladder. My goal is to teach her to walk along “with me” unless I give her permission to “go sniff.” Using the premack principle, the latter becomes reinforcement for walking nicely at my side until released. My body language also helps her to “get it” as when I tell her “with me” I walk along at a brisk pace and when I give permission to go sniff I slow down or stop and then follow her lead – as long as she doesn’t pull. If she did start to pull I just told her “uh-uh” and backed away as I gently reeled her back to my side and re-cued her to walk with me. After she had walked along with me for maybe 20 feet or so, I took care to return to the place she really wanted to sniff and gave her the cue to go do that. I let her sniff for several seconds until the intensity of her sniffing lessened and she seemed ready to move on, then I cued her to resume our walking. I was amazed at how quickly she caught on and how well this worked. I was also surprised that although she had not yet eaten (this is a dog who usually works very well for food if she’s hungry) she had no interest in clicks and kibble – all she wanted was the chance to go sniff. Of course I could have used higher value treats as I have in the past, but I really wanted to get away from needing to feed her a lot for loose leash walking, especially since doing that can use up the amount of food I would otherwise be able to use for training other behaviors at other times during the day. I was so pleased at our progress that I went home to grab my camera and make a video of how willingly she followed my direction to either walk with me or go sniff. Something that I haven’t seen come up in this thread is the purpose of walks. I think that as primates we’re often focused on the accomplishment of getting somewhere or getting exercise and forget that dogs have their own reasons for wanting to walk. I try to think of each walk as three walks in one. The walk is for exercise, for exploring/patrolling, and for training. Sometimes I’ll overlap them other times I’ll break the walk into thirds each devoted to one aspect. Ranger considers our neighborhood his territory and a large part of his walk is devoted to patrolling, checking on activity, renewing marks, etc. I make sure that when we go for walks he has time to do that. Of course, we both need the exercise, so a lot of the walk is done at as brisk a pace as I can sustain without actually running. And any time we are together is a great opportunity for some training. My husband is envious of some of the useful things that we’ve trained on walks. Because the leash is so slack Ranger often winds up stepping over it and having the leash wrapped behind one front paw. My husband stops bends down and either lifts a paw or fishes the leash back around. I stop and have Ranger take a step back over the leash. “step back” is one of the best things I ever trained. For me the pretty easy to follow instructions below were really helpful and turned out to work fast: Teach the dog first to stand with loose leash and reward with movement. Would love to hear from others who try it out! There are a few border collies doing very well working as service dogs, but not many. Karyn, who writes the blog THROUGH A GUIDE’S EYES is blind, deaf, and wheelchair dependent. Her service dogs have been bc’s because, well, she needs a genius dog. But most bc’s just don’t do well in city conditions or crowd conditions like walking through a crowded shopping mall or riding a bus. Many are sound sensitive, touch sensitive, or leash intolerant. A fair number have motion sickness. Since a training program has no idea just where a future client will live or what their lifestyle will be, they generally go with the breeds that are likely to succeed in all conditions, including riding a city bus every day, which usually means labs or goldens. I do Catahoula Rescue and you were my inspiration in my first days to try to help people understand a breed that is active, working, intelligent, quirky and wonderful while frustrating. I have had Catahoulas for 40 years, ranch in Montana and I am so grateful that a friend recommended your books, DVD’s etc. I can safely pass that recommendation on to others and I do. THANK YOU for all you do. The clear concise practical sensible way you present help for others flows and inspires and gives goals that are possible to attain to and easy to understand. I have had six Catahoulas at one given time and more than that through the 40 years and leash pulling is their bag. They are very focused as most working dog’s are. Mine on Cattle but basically on whatever they set their sights on. I appreciated all you wrote regarding leash pulling and giving explanation as to why dogs do it. We never quit learning and I find help and a dimension to my perspective enhanced and enlarged every time I visit one of your avenues of help. What I have believed in and worked to prove in my own dogs and in saving dogs and restoring them to their true potential while in foster care, you have helped me achieve and fine tune and improve on and when I have been on track you have verified that and I just wanted to say THANK YOU. You make us think and get out of the BOX. I am glad that loving and making a dog into a fine companion is an ongoing passion to some of us and we know that we never quit learning and growing. Thanks for helping us grow. @liz – I tried the “3,2,1” countdown with Pixie last night, and it did seem to make a difference on getting her going after sniffing things. I probably helps that I use that countdown when I throw food for her to catch, so it has a history with her. @Robin Jackson – I am looking into the Pattern Games, and think that may be very helpful. Part of me is wondering how much of that is the dog, and how much is the handler. There is nothing quite as frustrating as having a dog that refuses to walk, and I wonder if having the Games practiced calms down the handler and makes you more confident, which will, of course, flow down to the dog? Robin, interesting observations. Of course the main reason labs and goldens do so well as service dogs is their original task-specific breeding. A duck dog must sit or stand quietly for long periods, often with other people and dogs he has never met, then spring into action on a moment’s notice and continue to work in tiring conditions until the job is done, then go back to waiting quietly. The desire for a cold-water dog that would not flinch when winged birds flapped their wings or waves slapped their faces led to a dog with a high pain threshold, and high tolerance for movement near his face. The need to mark multiple fallen birds for retrieves, to follow hand signals, but also to be able to navigate natural obstacles without forgetting the marked retrieve led to a dog that was able to think, remember items in order, and also was very biddable. The same traits that made the dog an excellent specialized hunting dog also make him an excellent service dog—- and the high pain threshold combined with the tolerance for things in close proximity to their face lead to the types of “rude” behavior that can make them seem a bit obnoxious to non-retriever breeds at the dog park. And interestingly, most of the retrievers I know LOVE being patted on top of the head, something most other dogs find annoying. I distinguish between ‘walking beside me’ and ‘walking on leash’. As far as leashed go, I have found that the shorter the leash, the more the dog pulls. So I walk with a leash as long as I can manage it without it getting tangled as we go. The dog can then set its own pace, speed up or slow down as it desires, and stop and wait for you to catch up, or stop and let you pass when it finds an interesting smell. If we are in a crowded place, or we encounter other dogs or people on our walks, I call the dog in to “heel’. Such an interesting lot of comments! One trouble seems to be the retractable lead — which means that the leash is always ‘taught’. As Ann Bemrose said, the leash clip should always be *hanging down loosely*. This is the cue to the dog that it is ‘in position’. Start with a long leash, and let the dog do what it likes — but if at anytime the (heavy, please) leash clip is drawn to one side, STOP and wait. If the dog pulls you can wait it out, call it back or turn an face the other way. whichever works for that particular dog. Most dogs eventually get the idea — clip not loose, we go nowhere. Then you can work with increasingly short leads. If you are walking with a long lead, just shorten the lead when you want to dog closer. But NEVER pull the dog on the lead. if you pull on the lead, you are giving your dog the message that it is alright to have a tight lead. If necessary go back and hold the dog’s collar/harness and lead the dog that way. NEVER use leash jerks/pops. They tend to do no more than irritate the dog who will then lean to keep the leash taught to avoid the jerk! No-hands leads. I LOVE them — because they make us silly humans use our own body to efficiently cue the dog to say with us. That is, when we want the dog to stop, the hands-free leash means that we stop and lean of step slightly backwards. The very important proviso though it to wear the belt around your HIPS — never on your waist. Trish. I’ve used it with my German Shepherds with no problems. But only with a longish lead, which means I can take up the slack in my hands should an emergency seem likely 🙂 Even if you never use the hands-free belt and lead when out and about — they are a good exercise for ourselves!! em, stopping and planting can be solved (well I did it anyway:-) . Having taught my dog to keep the clip hagin freely, if they walk go the end of the ‘loose’ lead and stand and just look, I will move closer to whatever it is the dog wants to investigate — if it is an allowable things, if it is a bait, or somebody’s nice garden I will say something to the dog (Yuck!, or no you are not allowed into other people’s places) and if necessary call the dog back to me. Harnesses — 🙁 I had trouble with my German Shepherds pulling seriously on the *front* attach harness. Crabwise! 🙁 But when one of them had a neck injury (bite achieved by playing with a Cattle Dog 🙁 I found that on a back attach harness she walked very nicely. She walked ahead far enough to keep the leash ‘lightly’ taut so that it didn’t interfere with her feet, but not enough to be considered ‘pulling’. Interesting. I had very good luck with stopping as a leash training technique, too. However, I think the problem that Rebecca Rice and others were talking about was not so much stopping because the dog wanted to move toward something, but because the dog either adamantly did NOT want to walk forward (or walk at all), or because the dog was perfectly content to stay within loose leash range doing something undesirable like eating earthworms, etc. Stopping by itself wouldn’t address either of those problems, since they really are separate issues from general pulling. I’m really looking forward to what Trisha has to say on the topic. So true that stopping when you don’t want to stop is indeed a problem for many, the opposite of the leash lunger for sure. As I mentioned in an earlier comment, I’ve had the most luck with teaching a “forward” or “let’s go” cue inside, as Robin suggests, one step at a time, with few distractions. Gradually you take your act outside. I’ve also used that old time horse trainer trick of walking in circles. If the dog stops and won’t go forward I’ll walk toward and in front of it, making a circle. If you complete the circle lots of dogs, like horses, will continue walking forward with you. But if the dog is truly frightened, then you need to be talking about counter conditioning. Yup, deserves its own post! I also love Kat’s comment about the purpose of walks. I sometimes have to slow myself down and switch out of “Let’s walk forward with vigor!” to “You want to stop and sniff? That’s fine!” Once I started asking “Who is this walk for?” I’ve developed a different attitude to neighborhood walks. I myself like walking fast, but clearly my dogs want to explore the environment with their noses. I can do it with my eyes (and not my nose so much), but why deny them the pleasure, and intellectual interest, of exploring the world? I found it helpful to teach dogs “Sniff” and “Let’s walk,” so that when I am fine with them snorting around an otherwise barren patch of earth they are free to explore. When I want to stride forward, primate that I am, I say “Let’s Walk” and they know now it’s all about moving forward. Make sense? The one problem I run into with the “Sniff” command is that I will stop somewhere that, to me, appears to be a place that should have lots of interesting things to sniff out, and my dog looks at me like “what?… there’s nothing at all interesting here”. And yet, 5 feet away at that barren patch of ground, she is totally engrossed. Got any advice on how to figure out the good spots? I skimmed the responses quickly and did not see this mentioned, and I hope I’m not being repetitive. I frequently recommend front hook harnesses for clients, but I *never* recommend either the Soft-Touch Concepts models (Sense-ible, Sense-ation) or the Premier Easy-Walk. They are the least well designed of the front hook options. There are two major problems with both of them: Both have straps right across the shoulder joint, which can impede movement and may cause long term damage (Chris Zink hates ’em!). And both loosen easily. Once they’re loose, the dog can slip sideways and get a shoulder into pulling. Instead, the Freedom No-Pull Harness by 2HoundsDesigns is excellent — the shoulder straps sit higher and impede less; it has a strap from the neck strap between the front legs to the girth, which helps hold it in place much better; it has velvet underarm straps for sensitive-skinned dogs; it has a martingale loop on the withers in case you need to attach in two places for even better leverage; AND it comes in a ton of beautiful colors. Bonus — made in the USA, if you are one who cares about this. Newer, still a little hard to find, and really excellent, and a little pricier, is the Front Range Harness by Ruffwear. This is shaped more like a traditional harness, but it has a front loop. It also has padded underarms. If you want to switch the leash to the withers ring, it is a very safe shape for actually encouraging pulling (e.g. for tracking, nosework, or helping drag you up a muddy bank) without impeding shoulder movement. These are both a bit more expensive than the older designs, but IMO completely worth it for the added safety. A great article on some myths associated with counter conditioning leash reactivity. so, that said, we run together and I let him pull just a little (we have been working on dialing back the pulling, it doesn’t bother me honestly) because I think I would be frustrating the living daylights out of him to ask him to attempt to accomplish this on a loose leash (via the “you pull, we stop” method).. I have been working on his leash skills for a while now (he’s 3, got him as a puppy), I have found that he didn’t have the threshold to deal with frustrations like squirrels and rabbits until this year, as a 1-2 year old, he frequently had genuine tantrums on leash when a squirrel or rabbit was in sight, or god forbid, the prey actually ran away.. does anyone else have a dog that they feel this is just a very long term goal? He has gotten so much better, it’s tough to remember to focus on how far he has come when I see every lab and golden in the park trotting along like the world doesn’t exist except for their owner.. But, I do realize how hard it is for him, and he really tries.. He can now see a squirrel or rabbit and then turn to me to get a treat.. Unfortunately, I am struggling with the loose leash concept b/c the leash is a necessity to his exercise and I don’t know if it’s fair to take the dog equivalent of an Olympic track star out on his leash and demand that he walk nicely beside me.. I have a 7-month-old weimaraner and we are in an apartment. I’m having the same difficulties as Katrina. We simply have to get out for runs and walks for exercise and can’t stop every time he pulls. Do you think it makes sense to use a certain tool on our focused, training walks (perhaps martingale) and another tool (Easy Walk or Gentle Leader) when I simply need to get a good walk in for him? Or do you think all his exercise needs to be off leash somewhere? Like the dog park or perhaps on a long lead?